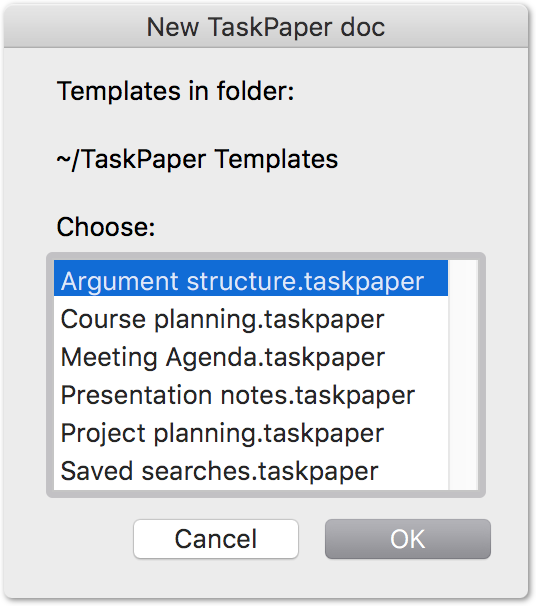 I think it would be a good idea, and beneficiary to all the users of Taskpaper to create a welcome text file within the application to support to change or modify the “Welcome text” of TaskPaper to the user’s liking. My idea of changing the default “welcome text” was to change it to something that I can use all the time and change every blue moon. When you proposed having a script or macro to do it, I thought… well, if I could have a folder with several of these “default texts” for certain jobs and I could pick and choose those when I am editing a document, that would be mind blowing awesome Something like those snippets that someone uses for coding, but for searches, tags, etc. So perhaps a script which supplements the usual ⌘N with something like ⌘⌥ N for ‘New document based on template’, and simply throws up a list of templates in a folder somewhere ? Although my original request was to have Taskpaper read a document in the application support folder and use that for new documents when the “Show Welcome Text” option was selected – if such document wasn’t available, then just read the welcomed text included in the .app package – I do like your idea better. Here is a very rough first sketch – if you would like to test it and suggest adjustments, we could put a version into the script wiki, and perhaps make Keyboard Maestro and LaunchBar etc versions ? Thank you. I added that to the wiki, and I think that we had enough scripts of this kind to create a new category. I like the script approach for now too. Maybe someday I would make a template document in the application support folder, but I think I’d rather live with the current “copy paste” favorite searches approach for a while. I think in the end it might make more sense to add some “built in” searches (that can be edited in preferences or something) so that you can use saved searches without embedding them in your doc. Then you could just used in document saved searches for very specific cases. Hey guys, the KM script above works great however it creates a new file instead of appending the template to an existing file (it’s listed on the TP wiki as “A script to append templates in a folder to document”). Has anyone tried to modify it to make it append to an existing file instead of creating a new file? Another idea would be to have it add the contents of the template to the open document (perhaps to wherever the text cursor is). 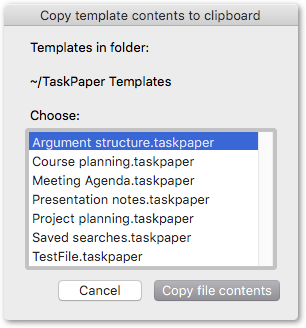 My goal would be to have template for projects / searches that I could add to larger taskpaper files instead of having templates for entire files. Thanks – I hadn’t seen that labelling of the script: amended now. Would it work for you to add a button to Copy the text of the selected template into the clipboard ? I guess that’d be quite useful because I could just add another action to the KM macro to make it immediately paste the clipboard to wherever my cursor is at. Thanks @complexpoint! This works great! While this is not a huge problem, I’d just like to point out that the script doesn’t deal that well with special characters such as ç, ã, ó, etc. For example, if a template contains the word “documentação” (portuguese for documentation), the script will copy it as “documenta√ß√£o”. This is not a deal breaker however I believe other users might welcome a fix for this issue as well. Should work OK now, I think. @complexpoint Yeap! That fixed it!